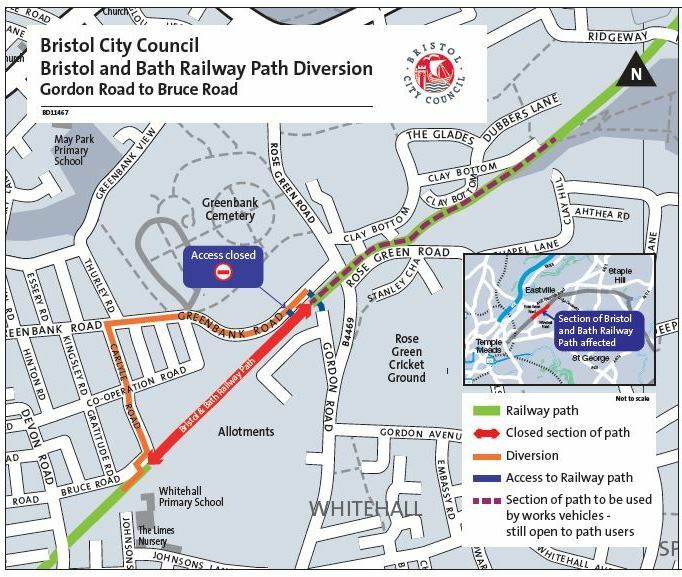 The Bristol and Bath Railway Path will be closed between Gordon Road and Bruce Road from Monday February 18 to Friday February 22 2019 to carry out some essential tree works. The tree work is taking place in the area opposite the Chocolate Factory in Easton. The council’s tree team will be removing three willow trees and one poplar tree which, on recent inspection, need to be removed as they are unstable, in decline or have defects which are significantly weakening the trees. Seven other willow and poplar trees are being removed as their roots are starting to damage the path, making it unsafe for cyclists and pedestrians. Work will take place later in the year to repair the damage already affecting the path. Alongside this, five large willows will be pollarded. This involves cutting off the top and branches of a tree to encourage new growth at the top. These will then be put on a regular pollarding cycling every four to six years, depending on regrowth. Other minor works to remove parts of the tree canopies touching buildings will also take place. Councillor Asher Craig Deputy Mayor with responsibility for parks, said: “We understand that the path is well used and we do not take the decision to close it lightly. “However, we have to prioritise the safety of people using the path, and root damage to the path’s surface is starting to make it increasingly broken and uneven. Later in the year there will be a rolling closure of sections of the path to resurface it and repair where it has been damaged by tree roots. This is being left until late spring/early summer, as tarmac is easier to lay and less likely to crack in the warmer weather. Press release by Bristol City Council.